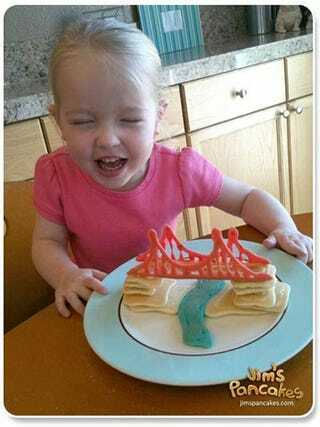 "Jim's Pancakes" is a site on which the world's coolest dad makes amazingly creative pancakes for his 3-year-old daughter. What follows is nothing short of breathtaking. It's hard to know which are the most awesome: the theme ones, like this 4th of July guy. This one was inspired by a trip to the museum! The trompe l'oeil are also pretty amazing! This, while objectively gross, was apparently a big hit with the pre-school set. See all of Jim's pancake creations at his site...and be either inspired or despairing, depending on your level of pancake dexterity. Either way: thanks, Jim and Internet!